Cackling Goose is a rare fall migrant through Massachusetts and I usually see a couple of them each fall among the hundreds of Canada Geese around Concord. 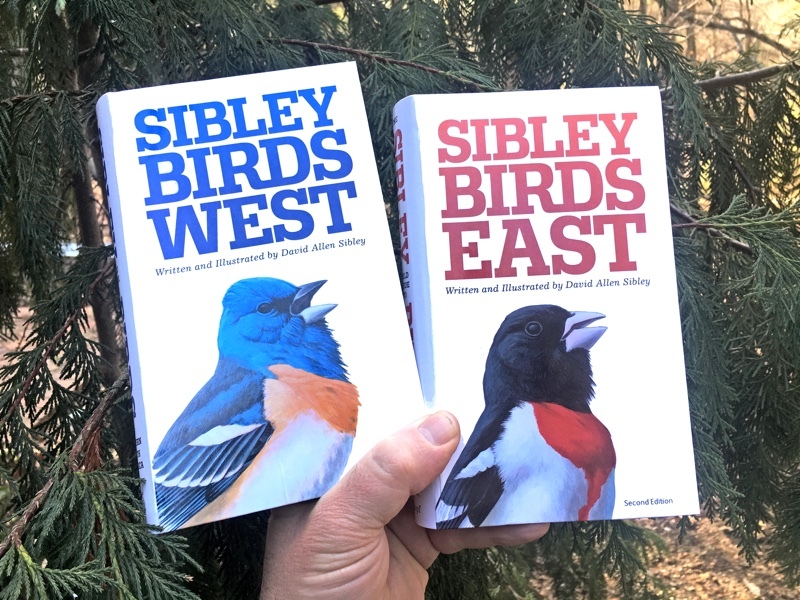 I look forward to the challenge of sorting through the flocks and picking these birds out, and once a candidate is located the identification has usually been straightforward – until 2014. A classic Richardson’s Cackling Goose (left) with a typical Canada Goose (right). The Cackling’s smaller size, relatively small bill and short neck, silvery gray back, and darker gray-brown breast with narrow white collar are all evident here. Belmont, MA Dec 2014. Photo copyright David Sibley. 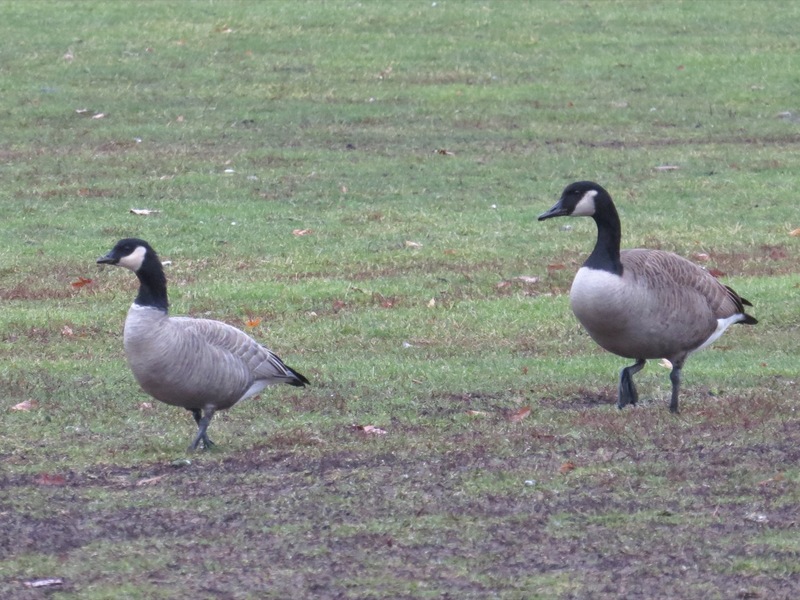 In Massachusetts there are two distinct subspecies groups of Canada Goose: the breeding population (the “nuisance” geese of the suburbs) present year-round except during heavy snow cover, and northern migrants which arrive mostly in October. Learning to recognize these two forms helps with understanding the variation in Canada Goose. 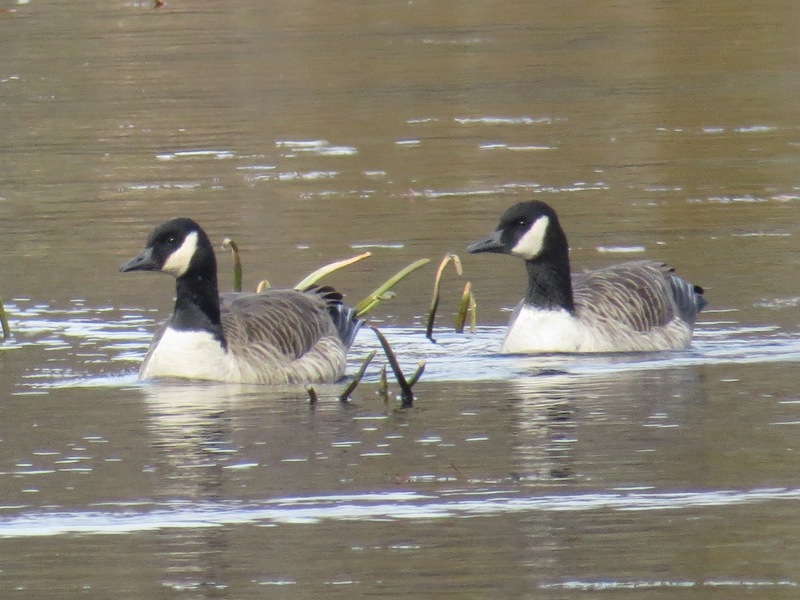 Two subspecies of Canada Goose. Acton, MA, 7 November 2014. Photo copyright David Sibley. In the photo above the larger goose on the right shows features of the mostly resident suburban Atlantic coast population (mixed subspecies moffitti and maxima) and the two birds on the left show features of migrants from the northern Quebec/Labrador breeding populations (subspecies canadensis or interior). The smaller size of the migrants can be obvious, as it is here, but there is plenty of overlap. 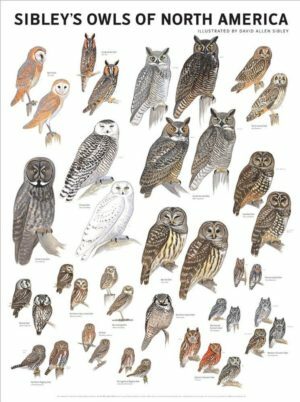 Also note their dingier gray-brown breast color, and the fact that the far left bird is still in mostly juvenal plumage in November. Local residents molt out of juvenal plumage in September. 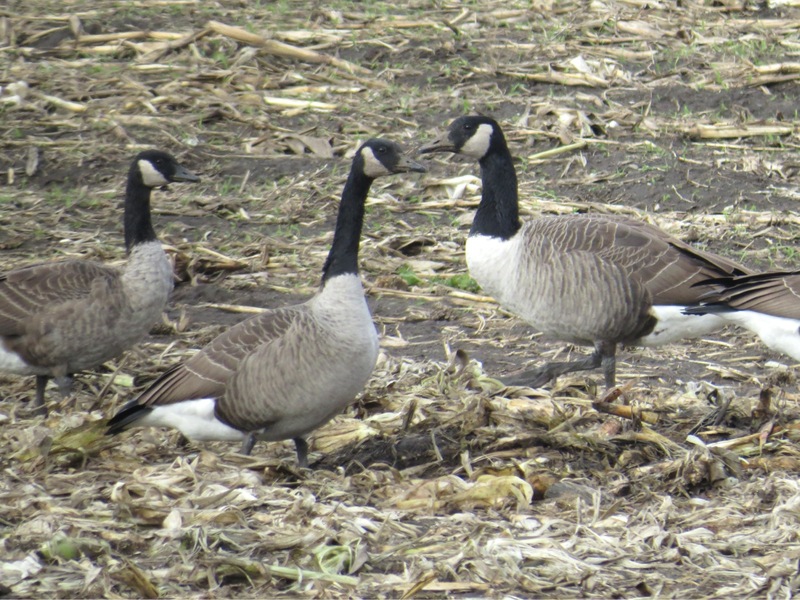 Canada Goose (left) with three smaller Cackling-ish geese. Concord, MA, 5 Nov 2014. Photo copyright David Sibley. One of the nice things about goose flocks is that geese maintain strong social relationships and birds tend to cluster in stable “subflocks”. Sometimes these are family groups, sometimes all adults, but I take it as a strong indication that the clustered birds share a common geographic (if not familial) origin. 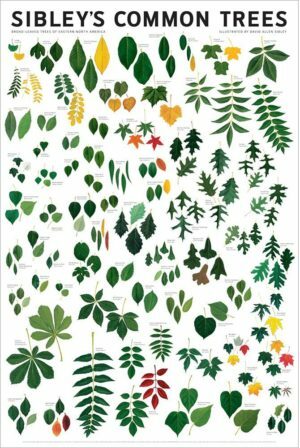 This can be very helpful for identification as it allows a sort of “average” impression of a whole group, which helps to cut through some of the extensive individual variation. 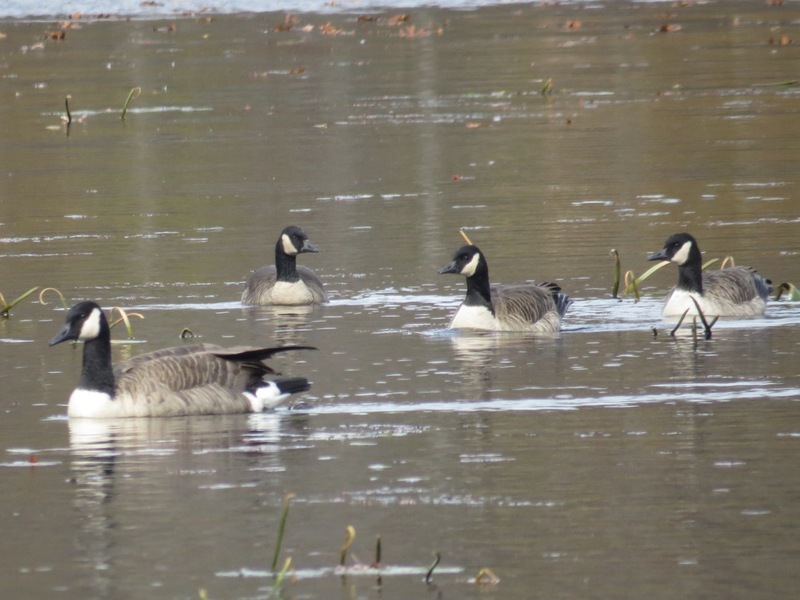 In this case the three smaller birds were staying together as a group, so I was trying to fit them all into the same species, either Cackling Goose or Canada Goose, not a mix. Here is a close-up of two of the smaller geese. Two Cackling-ish Geese. Concord, MA, 5 Nov 2014. Photo copyright David Sibley. I can’t call these Cackling Geese; they are just a little too long-billed proportionally. On the other hand, I can’t call them Canada Geese either because even the right-hand bird is too small and dainty for any of the usual Canada Geese in Massachusetts. Over the next few days I found at least three satisfactory Cackling Geese, but it became clear that there was a large group of at least 80 birds, all staying more or less together, that were a variable mix of intermediate sizes and colors. Atlantic resident-type Canada Goose (front) and Richardson’s Cackling Goose (second from front), with a mix of intermediate birds beyond. Acton, MA, 7 Nov 2014. Photo copyright David Sibley. Behind the Canada Goose and Cackling Goose in the foreground of the photo above, the cluster of geese on the right could be normal northern migrants, although they seem just a bit small for that. The four on the left, a family group, are distinctly smaller than any of the usual Canada Geese in Massachusetts, and the darkest juvenile (second from left) is unusually dark. Two Cackling-ish geese. Concord, MA, 8 Nov 2014. Photo copyright David Sibley. 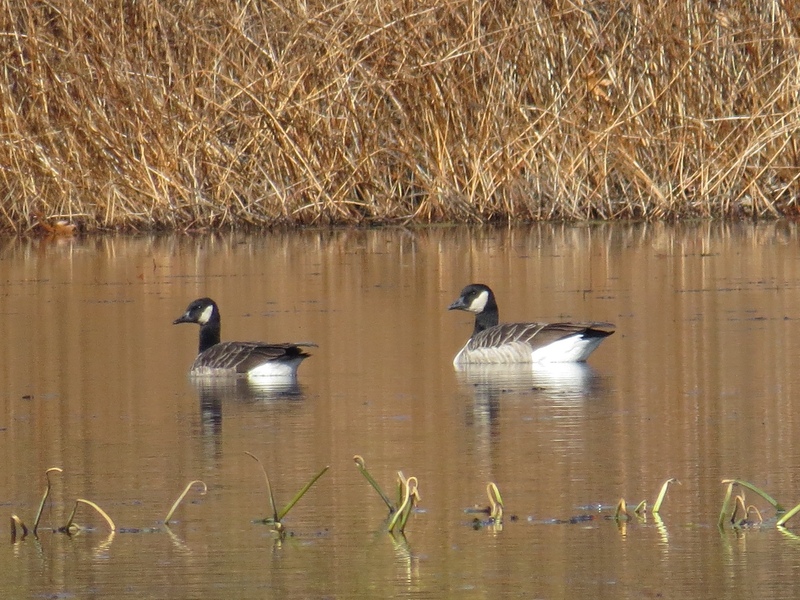 These two (adult male on the right and juvenile on the left) are part of a family group of 7 (also shown in the next photo) that were all confusingly close to Cackling Goose but not quite right. The adult male (on the right, above, and back center, below) had a relatively large body but short and stout bill. 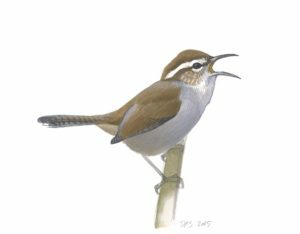 The adult female was longer-billed while the juveniles, although small-billed and small overall, had more Canada-like bill shape. A whole family of Cackling-ish geese (back). Concord, MA, 8 Nov 2014. Photo copyright David Sibley. Canada Goose (center foreground) and many variably Cackling-ish Geese. 8 Nov 2014, Concord, MA. Photo copyright David Sibley. In the photo above, the alert bird at left center looks small and small-billed, outside the range of the typical Massachusetts Canada Geese. The other swimming birds to varying degrees show paler silvery back color, small size, and short necks suggesting Cackling, in contrast to the single typical Canada Goose in the foreground. The group out of focus at the back right is the same family group featured in the previous two photos. A Cackling-ish Goose (second from back) surrounded by a variety of less Cackling-ish geese. Concord, MA, 9 Nov 2014. Photo copyright David Sibley. During the week or so that this flock was around I found them on most days and spent hours studying them. I waffled between wanting to claim as many as 50 Cackling Geese (unheard of in the Atlantic states), or just calling them all Canadas. Officially I felt comfortable reporting at least three different Cackling Geese, but unofficially I couldn’t figure out what to do with the ten or twenty other birds that were “near-Cackling”, and those blended with a few dozen others that were slightly larger, and so on. One obvious possibility is that these birds represent the smaller subspecies of Canada Goose – B. c. parvipes or Lesser Canada Goose. Conventional wisdom says this subspecies nests across northwestern Canada but recent genetic evidence refutes that, and suggests that small Canada Geese may occur only in Alaska (Leafloor et al, 2013), and in Alaska the situation is very murky. Given that, the chance of a whole flock of Lessers showing up in eastern Massachusetts is vanishingly small. 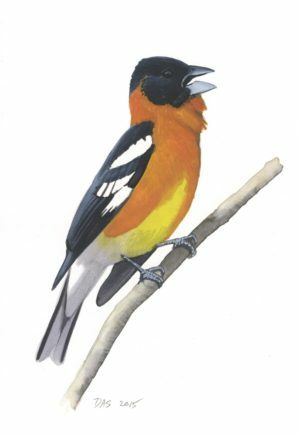 And to claim a flock of Lessers in Massachusetts I would want them to be a more uniform and discrete flock of medium-size birds, unlike the mixed flock that I saw, which ranged from Cackling-size to Canada-size in one loosely-associated group. I hesitate to suggest it, but I think the evidence points to the possibility of this being a mixed flock of hybrids and backcrosses. Hybridization between Cackling and Canada Goose has been documented on the western shore of Hudson Bay (Leafloor et al, 2013) and there’s no reason to think it’s limited to that area. Farther east Cackling and Canada Geese meet on the breeding grounds in northern Quebec, Baffin Island, and Greenland – all normal sources for Massachusetts geese. I’ve seen the occasional confusing individual goose in the past, but never a large group like this. Maybe I’ve overlooked them, or maybe several small groups just happened to converge on Concord, but it’s possible that the large numbers I noticed this fall are a new phenomenon. With climate change there have been big shifts recently in the distribution and numbers of nesting geese in that region, which could lead to other changes. This is all just a working hypothesis, based on lots of suppositions and with lots of unanswered questions. Regardless of the answers, it’s clear that identifying Cackling Goose is not as straightforward as I thought, and goose-watching will be more challenging and more interesting because of that. Perindopril possible use in cost wellbutrin generic cancer therapy..
1. Why did you say the left-most bird in the second photo from the top is in juvenal plumage? What exactly are you looking at? 2. You did not mention anything about the shape of the cheek-patch. I read that an L-shaped white cheek-patch is somewhat (not totally) characteristic of Richardson’s Cackling. Have you found that feature useful at all in separating geese? 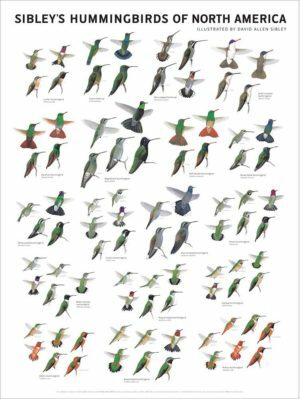 Hi Soheil, the shapes of feathers on the flanks and back are more rounded in juvenile, and create a more spotted pattern vs the barred pattern of adults. I posted about that in 2009 here. I’ve never found anything useful in the shape of the cheek patch. It varies a lot in both species, and there may be average differences but nothing ever caught my attention. Thank you for this thorough and illustrative entry. It will cause me to take a longer pause at the pond’s edge or on the golf course! I’m glad it’s not just me…. Down here in DC and northern Virginia I sometimes find delicate Lesser-type Canada’s mixed with the local big brutes and smaller presumed migrants. This same flock usually records Cackling a few times during the winter as well. It seems like a concerted effort to document this variation might add to our knowledge, even if it doesn’t definitively resolve the issue! Yes, I’ve been confused by these intermediate small geese for years, but now that the “Lesser Canada” situation is clarified a bit (at least here in the northeast), I’m getting more comfortable now with the idea of hybridization, and I think paying more attention to groups of “small Canadas” and “Cackling-ish” geese will lead to a better understanding. 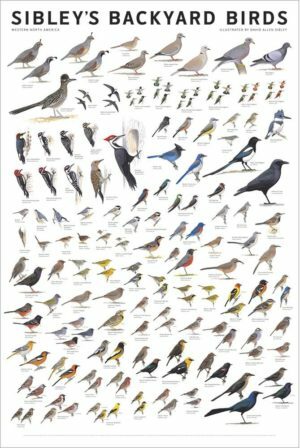 It’s a tremendous challenge though to distinguish those birds from extreme individuals of the pure species, very subjective. Feel free to come on out to Sauvie Island in the Columbia River, downstream from Portland, Oregon. Between the Taverner’ and minima Cacklers, and the Lesser, Dusky and resident Western’s, I am sure you can spend some enjoyable hours :). Then hit Tillamook for a few Aleutian’s! 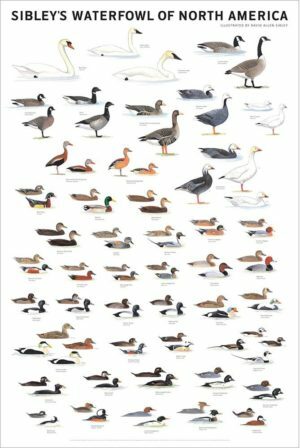 I always post this link each fall on the local listserv to help folks id the geese in the Willamette Valley. 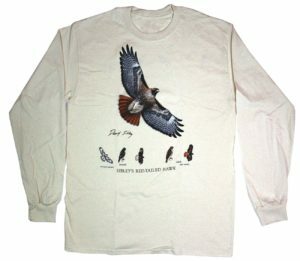 It was put together by the ODFW to help hunters, but it is very good. It does not cover geese outside the Pac Northwest. Bob, Excellent guide! Thanks for sharing it. We have an interesting mix of Canada’ on the Potomac near DC at present. 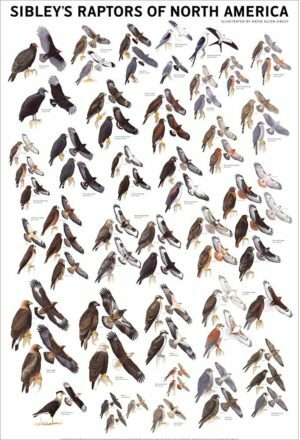 Approx half of the 400 or so flock seem to be smaller, shorter neck, smaller bill ‘Lesser’-types with the remaining being the larger, long neck, long-billed, presumably resident birds. 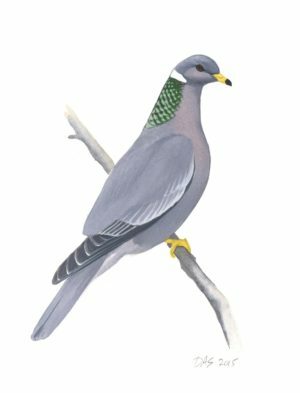 It is the latter group who are the noisy and aggressive birds. 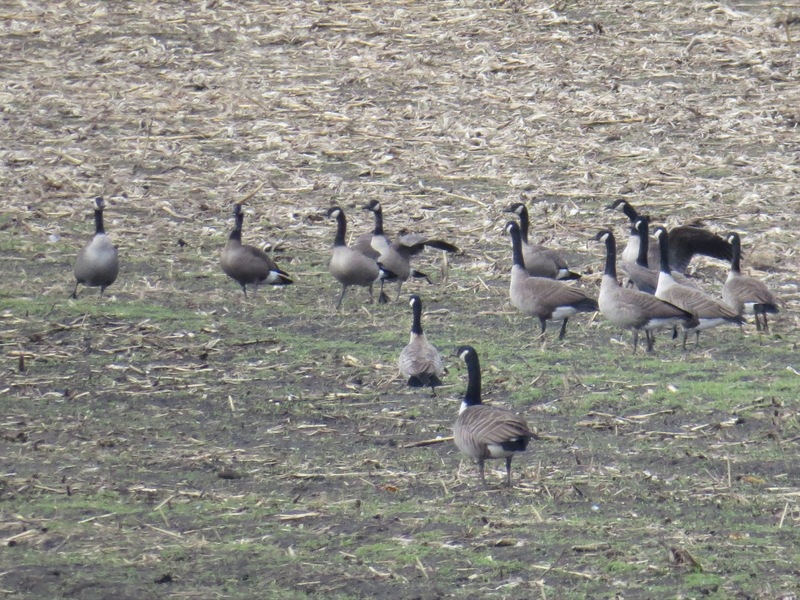 There is reported to be a cackling goose in the flock and also the greater white-front pictured. Thanks for this interesting and timely post. 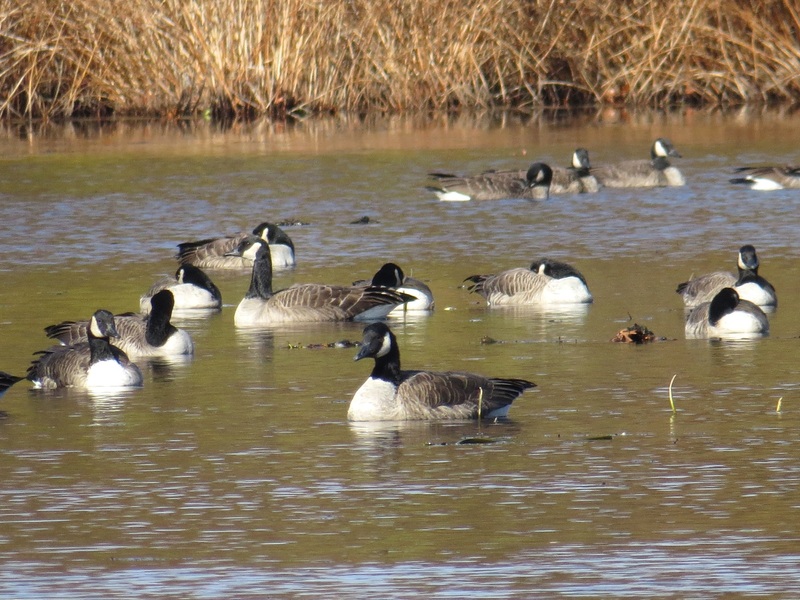 Here in southeast Pennsylvania, there are plenty of Canada Geese and Cackling types to keep a birder busy for hours. To me, I’ve seen fewer textbook Cackling and more and more of these Cackling-ish types beginning about two years ago. I started to be aware of this when I was seeing flocks of 10-20 of what I thought were Cackling Geese when normally only 2-3 would be found each winter. I’m now finding these Cackling-ish types in nearly every flock Canadas I come across in winter. Most of these birds seem to be Cackling in all respects except for size, they are just a little too large. It will be interesting to see what’s next. Thanks for the report, and it sounds like your experience mirrors my impressions here. It will indeed be very interesting to see where this whole situation is in years to come. My experiences with the “small” migratory geese mirror yours and Nick’s (previous post). 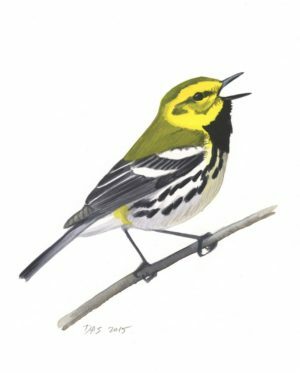 A leg band that I had reported from one of them (observed in Thompson, CT) indicated that it was banded as a juvenile on Prince Edward Island, if that helps at all. I too notice that they tend to stay together as a group when mixed in with the local winter populations (suggesting that they have migrated together from the “same” genetic stock and likely are not isolated local anomalies). There are places in Tennessee where Cacklers and Cacklerishes winter by the hundreds. Where to draw the line on a CBC is always a concern. 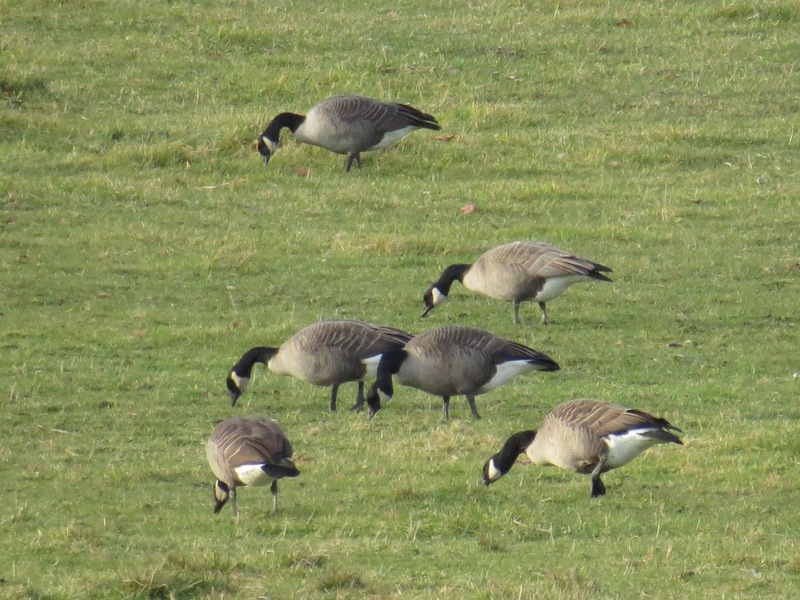 As to whether this is a new thing… not much attention was paid to these small geese by most birders in the eastern U.S. before Cackling became a “countable” species, so it is really hard to know. I do remember in 1990s in Colorado before the Cackling split, that the small geese seemed to me to be a confusing mish-mash. I would also be surprised if hybridization could create a massive change in just a few years, even with climate change effects, if these really are two species and should thus have some sort of isolating mechanisms. It sounds like there is a lot of potential for interesting genetic studies of the small white-cheeked geese in the eastern and central U.S.; surely there are grad students out there looking for thesis topics! Sorry to follow-up on myself. It seems to me that, if the numbers of these small Canadas are really increasing, it is perhaps more likely to be caused by environmental stresses resulting reduced size within the existing B. c. interior (etc.) 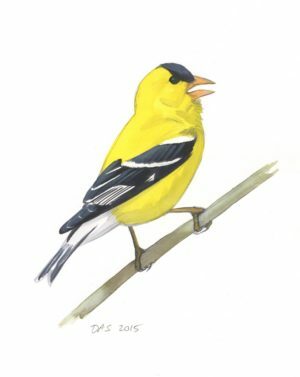 populations, rather than hybridization between species. It might only take one generation of stress to produce a whole lot of small geese, with no need to change the population genetics or shift breeding ranges. I’ve always been fascinated with subspecies, and earlier this morning I was staring down hundreds of Canada Geese. 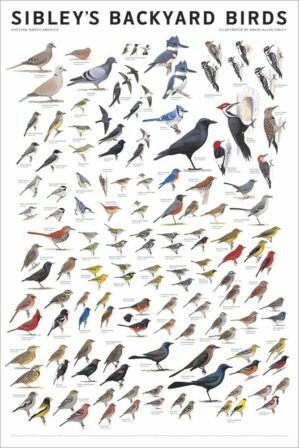 I found that I had the same thing of finding all of these cackling-ish birds! 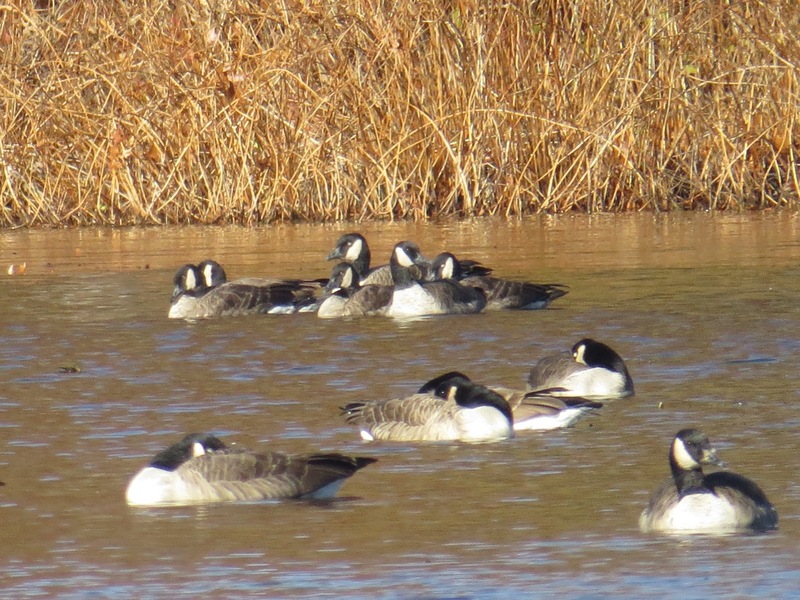 There really are no extensive sites that I have found which cover subspecies of Canada Geese well, and it is most likely due to high individual variation. Thank you for the nice write up on this topic, it has furthered my interest! 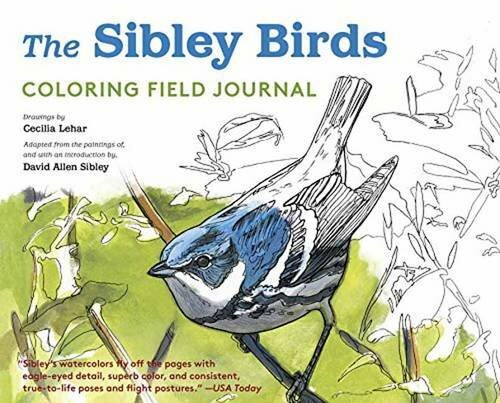 Here is an “SA” from the winter 2013-2014 Colorado and Wyoming regional report from North American Birds (a journal that is de rigeur for any birder with any interest in bird distribution; http://www.aba.org/nab/) of which I am the senior author, though the SA was penned by Steve Mlodinow. Oops. I meant to include a link to the original Cackling ID article. Here ’tis. Hi Tony, Thanks for passing this along. There is, amazingly, still a tremendous amount we don’t know about Canada and Cackling Geese.